A Business Review is an annual comprehensive analysis of your business designed to identify short and long-term threats and is included in the CPrint program at no additional cost. Basic Question: “Why won’t this business be in business twenty years from now?” The answers are threats. Prioritize the threats; eliminate the most immediate first; and continue until all threats are eliminated. This assures the most immediate are always being addressed. Just as our military cannot guarantee whether they will be able to beat up the bad guys in combat; they can guarantee if they are doing everything they need to be prepared. That’s why every military unit participates in “inspections” and larger corporations perform “internal audits.” Our Business Review provides a similar function. Broad areas include: cash (finance); time (organization); sales; and occupancy. Financial tests include cash flow, having enough cash and current assets on hand; and more such as the soundness and protection of accounts receivable. Organizational tests measure the application of organizational principles to your business and staff. Are you organized around functions rather than people to get the most out of your team? 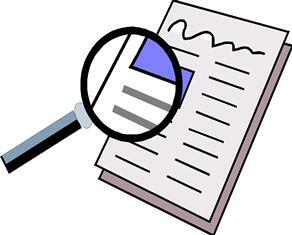 Production management and employee policies are also reviewed. Sales tests includes a special emphasis on TOMA activities (top of mind awareness such as prospecting), sales trends, selling activities, and dependency on significant accounts. Finally, occupation tests deal with leases or building ownership. Additionally, any other threat to the business is also reported. Take-Aways: you receive a thorough written review including an executive summary, action plan and cash-flow budget along with exhibits. Delivery: This review is conducted through an on-line video conferencing as well as email and telephone avoiding travel expenses. Each review starts with gathering pertinent information and an initial conference. Delivery includes a full report as well as a review of findings, recommending actions as well as a budget session and other sessions as needed. 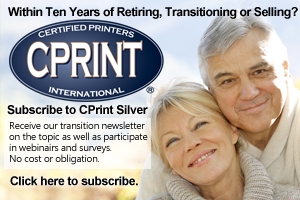 Commitment: the CPrint program has a short six-month commitment, with a sixty-day notice opt-out. Recommended: The program is especially recommended for businesses with family members or with inactive partners, as well as other situations where there may be an immediate threat such as lack of cash or loss of a significant customer. It is also useful for those considering the sale or transition of the business in the near term (1 to 5 years). Please message Tom Crouser at tom@cprint.com for a no-cost or obligation initial consultation.